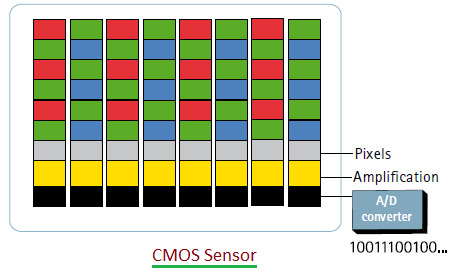 This page compares CCD vs CMOS and describes difference between CCD and CMOS image sensors. The page explains comparison between CCD sensor and CMOS sensor used in camera for image capture. Their unique working operations, advantages, disadvantages and applications are also described. Both CCD image sensor and CMOS image sensor consist of 2-dimensional array of thousands of discrete pixels. The amount of light on these pixels generates free electrons. The quantum of charge depends on intensity of incident photons. Both CCD and CMOS depend upon photoelectric effect in order to create electrical signal from the incident light photons. Both uses different technologies in order to capture digital image. Both the sensors differ in conversion of charge into voltage as well as readout of the chip. ➨CCD transfers each pixel's charge packet sequentially to convert its charge to a voltage. ➨CCDs consist of array of thousands to millions of light sensitive elements known as pixels etched on silicon surface. Each of the pixels is buried channel MOS capacitor. CCDs are fabricated using p-type substrate and buried channel is implemented by forming thin n-type region on this surface. ➨The size of CCDs are specified in Megapixels. A megapixel value is equivalent to multiplication of number of pixels in a row and number of pixels in a column. ➨Let us understand operation of CCD sensor. • When sensor array is exposed to light, number of electrons (i.e. quantum of charge) held under certain pixel will vary directly as per luminous intensity exposure of that particular pixel. • Charge is read out by suitable electronics and converted into digital bit pattern which can be analyzed and stored on the computer. This digital bit pattern represents the image. • In order to record images in full colour, Bayer's color filter array is bonded to sensor substrate. This filter array is made of alternating rows of red/green, blue/green filters and known as RGBG filter. A particular color filter allows photons of that color to pass through to the pixel. • EMCCD (Electron Multiplying CCD) is used in place of traditional CCD to overcome its drawbacks. EMCCD uses electron multiplying structure on chip. Hence EMCCD can detect single photon events without image intensifier. EMCCD sensor achieves higher sensitivity and higher speed due to amplification of charge signal before charge amplifier. • It offers higher sensitivity in low light conditions. • It possesses high speed imaging capabilities including better daytime imaging performance. • It offers reduced likelihood of damaging sensor while viewing in bright conditions. • It has high power consumption due to requirement of active cooling of CCD. Due to operation at extreme low light conditions, EMCCD offers wide range of applications as follows. ➨In CMOS, charge to voltage conversion takes place in each pixel itself. 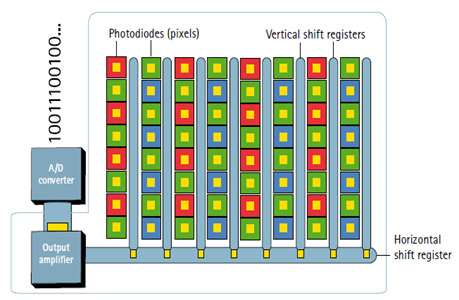 ➨Unlike CCD sensor, in CMOS sensor, each pixel has its own charge to voltage converter, amplifier and pixel select switch. This is shown in the figure-2. ➨It uses active pixel sensor architecture unlike CCD's passive architecture. ➨The CMOS sensor also incorporates on chip amplifiers, noise correction circuits, A to D converter and other circuits which are critical to operation of the sensor. In this case, chip directly outputs digital bits. Due to these functionalities on the chip itself, area for the light capture reduces. ➨In CMOS sensor, uniformity and imade quality is poor as each pixel does its own conversion. ➨Readout mechanism is massively parallel which allows higher bandwidth for higher speed. Following table compares CCD sensor vs CMOS sensor and summarizes difference between CCD and CMOS image sensors. Applications It is used in cameras offering excellent photo sensitivity with focus on high quality & high resolution images. It is used in cameras offering lower photo sensitivity, low image quality and low resolution.